• If you have any questions about taking SUPREP Bowel Prep Kit, call your doctor. SUPREP Bowel Prep Kit is a split-dose (2-day) regimen. Both 6-ounce bottles are required for a complete prep. 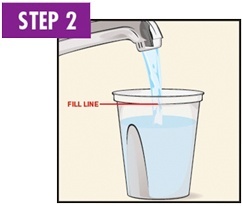 Step 2: Add cool drinking water to the 16-ounce line on the container and mix. NOTE: Dilute the solution concentrate as directed prior to use. 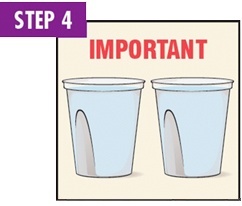 Step 4: You MUST drink two (2) more 16-ounce containers of water over the next 1 hour. Begin Step 1 FIVE (5) hours prior to your colonoscopy. 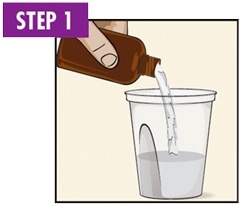 For this dose, repeat Steps 1 through 4 shown above using the other 6-ounce bottle. 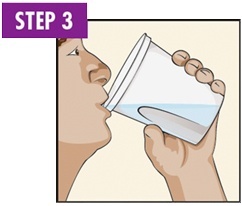 NOTE: You must finish drinking the final glass of water at least FOUR (4) hours or as directed, before your colonoscopy. **There should be no gum, candy or water FOUR (4) hours prior. ** Essential medications (ie: blood pressure, cardiac, thyroid, and seizure medications) can be taken TWO (2) hours prior to procedure with a TINY SIP OF WATER.